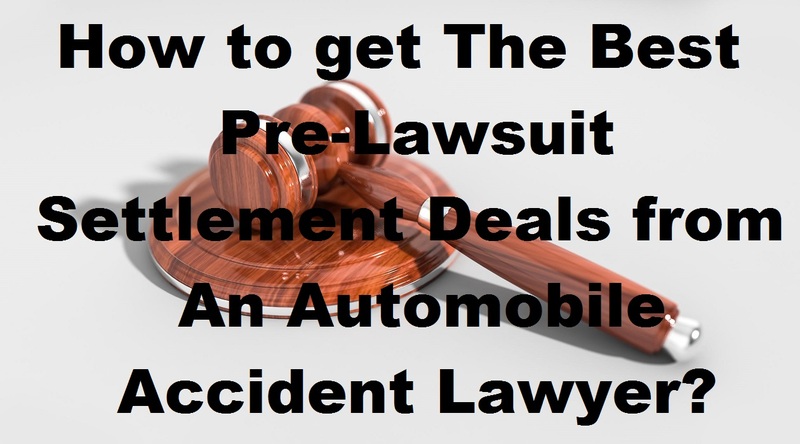 Home / Law / How to get The Best Pre-Lawsuit Settlement Deals from An Automobile Accident Lawyer? How to get The Best Pre-Lawsuit Settlement Deals from An Automobile Accident Lawyer? An automobile accident can be a horrific experience for any individual. The event can change his/her life forever. You certainly don’t want to go through this trauma for obvious reasons. However, you may become a victim of one. Many thoughts may be going through your mind in the aftermath of the ordeal. The most important being whether it is worthwhile to hire a reliable automobile accident lawyer. You may assume taking such a step means you have to go to court. Otherwise, getting the compensation you deserve may turn out to be a tall order. What do automobile injury lawyers do in an out-of-court settlement for their clients? Legal experts admit standing trial for a motor car accident lawsuit is both stressful and expensive. Lawyers specializing in this field can never predict with the likely court verdict for their clients. On top of this, the whole courtroom procedure is a time-consuming affair. This is why the victims of such mishaps consider other viable options. One of them is agreeing to an out-of-court settlement with the guilty parties’ insurance company. These individuals need to understand an important fact about taking this step. The legal professional representing them will only commit to this arrangement with their consent. The lawyer first submits his/her client’s claim to the insurance provider of the guilty party. New York City automobile injury lawyer ASK4SAM specialists say this laborious task. The amount of paperwork this expert has to deal with is huge. It involves appointing investigators to gather evidence from the accident site and collecting copies of the police report. Moreover, this professional also needs to consult the victim’s doctors for obvious reasons. He/she takes copies of the relevant documents from them relating to their clients’ injuries. The legal expert may even talk to a mechanical engineer specializing in accident reconstruction. This is necessary to gather proof of the impact of collusion and any malfunction in guilty party’s vehicle. The guilty party’s insurance company may request the victim to enter into a pre-lawsuit arrangement. The official of this establishment generally takes such a step for obvious reasons. It saves the plaintiff and defendant going to trial in a court of law. On receiving information about such an agreement, the lawyer has to make a decision. While doing so, he/she keeps in mind the best interests of his/her client. Only then does this expert advise his/her client on what to do. Negotiations of out-of-court settlements in accident cases are always very complex. Each party endeavours to get a better financial deal. The only lawyer with the necessary skills, knowledge, and experience can handle such talks. This expert can ensure his/her client gets adequate compensation for the ordeal he/she goes through. In cases, this money may more than what this individual is likely to get in a court verdict. An out-of-court settlement may be advantageous to motor car accident victims. However, they need to hire a proficient automobile injury lawyer to conduct the negotiations. Only this professional can perform the above 3 essentials function for talks to be conclusive. This ensures these individuals get the results they are looking for.